If you’re looking for the best bars in Lviv, you’ve come to the right place. 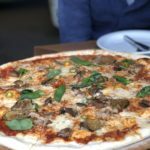 After five weeks of eating and drinking my way through the city, I’ve discovered that there are so many great places to grab a drink… it all just depends on what you’re looking for! 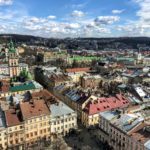 This list breaks down not only the best bars in Lviv but also the best drinks to order at each one, the prices you can expect to pay, and even a link to their locations on Google Maps to streamline your bar hop through the city. 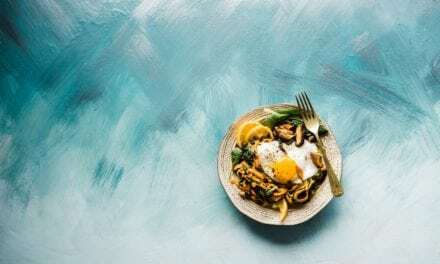 Just make sure to bookmark this article because all of these bars are in walking distance of Rynok Square (or in Rynok Square itself) so you’ll definitely be able to hit quite a few in one night! Opera Underground is one of the most unique places on this list and definitely the best bar in Lviv for cocktails. It’s built under the Opera House into a really cool space with interesting art all over the walls… but the most interesting part is definitely the cocktails themselves. 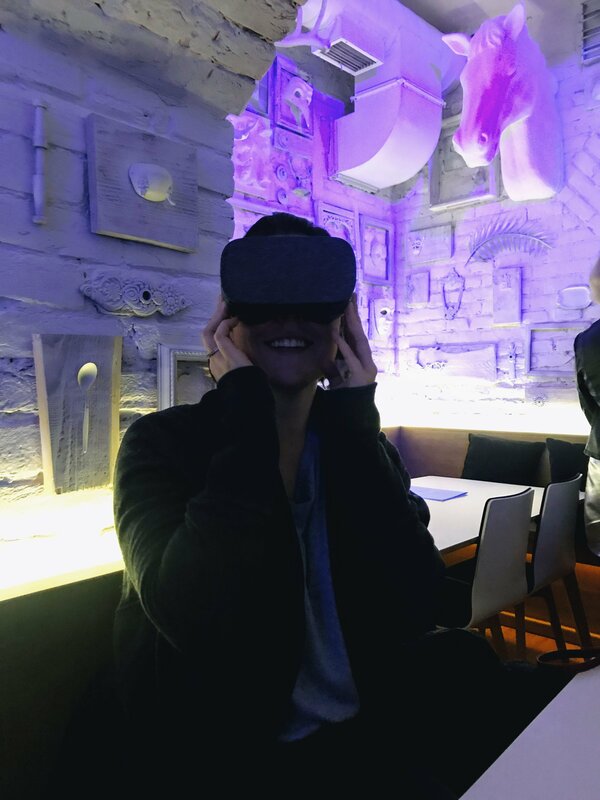 I ordered the VR cocktail which came with a VR headset experience while Dan’s drink was served in a bathtub. We also saw drinks served in desk lamps, aquariums (with live fish), smoking fire extinguishers, bongs, and so much more. I mean, in London or NYC this place would be $20+ for a cocktail so it’s absolutely worth a visit while you’re here. You’re in for a memorable experience for sure, and the drinks are pretty damn tasty too. Whiskey lovers in Lviv cannot miss 4Friends Whiskey Pub. Their list of international whiskey options is extensive and the basement is quite cozy, with leather seats and stone walls. You can choose to get just one shot or buy a set of five and get a 20% discount. Prices vary greatly based on quality, age, and country of origin but you can expect to pay a minimum of 130 uah / 5 usd for each 25 ml drink. They also have whiskey cocktails and beer for those still scarred from the low-quality warm whiskey shots they took from plastic bottles in college (aka me). Pravda Beer Theather is impossible to miss because the four-story building with soaring glass windows is located smack in the middle of Rynok Square. Pravda is the biggest brewery in Lviv and one of the biggest in Ukraine. Their head brewer from 2015 to 2018 was American and experimented with tons of new flavors and styles so you can find IPAs, double IPAs, Belgian tripels, red ales, stouts, hefeweizen, sour beers, and so much more lining their shelves. Beyond that, Pravda is one of the best bars in Lviv because they have a rotating list of beers on tap as well, an in-house orchestra, a dance floor, food, and just good vibes all the way around. If you want to try true Ukrainian beer, order Zenyk, a blond ale made with only Ukrainian ingredients. Tsypa is like Pravda’s little brother located just around the block from them. The craft brewery has indoor and outdoor seating (in the spring and summer) and I really like it for two reasons. They have a mix of their own beers on tap along with a few other interesting breweries (unlike Pravda, who only serves their own) and their beer is just really good. Plus, you can get small 200 ml tasters for 25 to 30 uah / 1 usd each and create your own flight. Just like you can’t miss Pravda, you’re also bound to run into a few of the Drunk Cherry storefronts during your stay in Lviv. Three of them are scattered around the city, with the most central located in Rynok Square. This bar sells only one thing: cherry wine. Bread and Wine is so freakin’ cozy, you’ll love it. With low ceilings, antique desks-turned-tables, and candles at every place setting, it’s the perfect bar to relax and unwind at with a glass (or three) of wine. 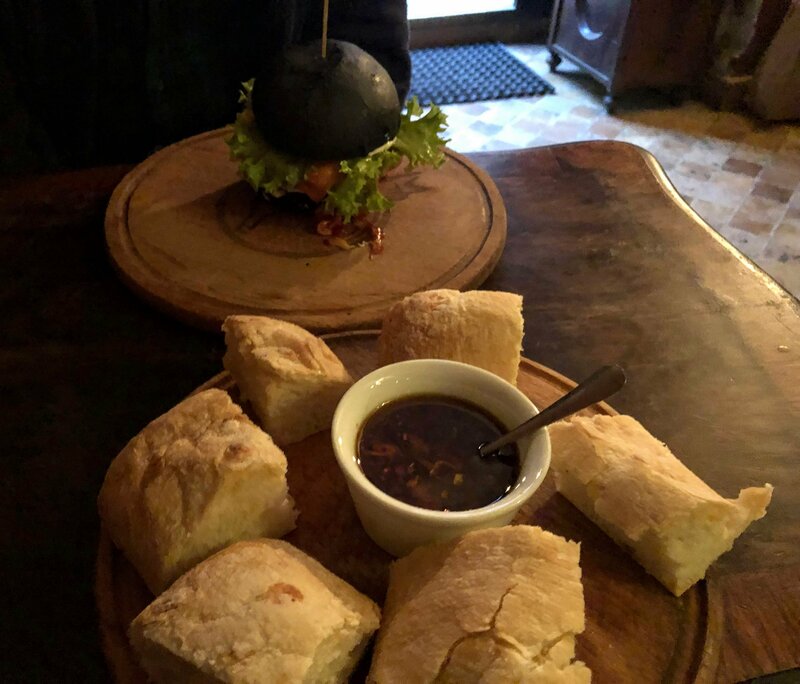 As the name suggests, they also serve ah-mazing bread and cheese platters, so it’s one of the best bars in Lviv if you want to eat as well. If you’re hungrier, you can also get sandwiches or their famous black burger which was heartily Dan-approved on our last visit. 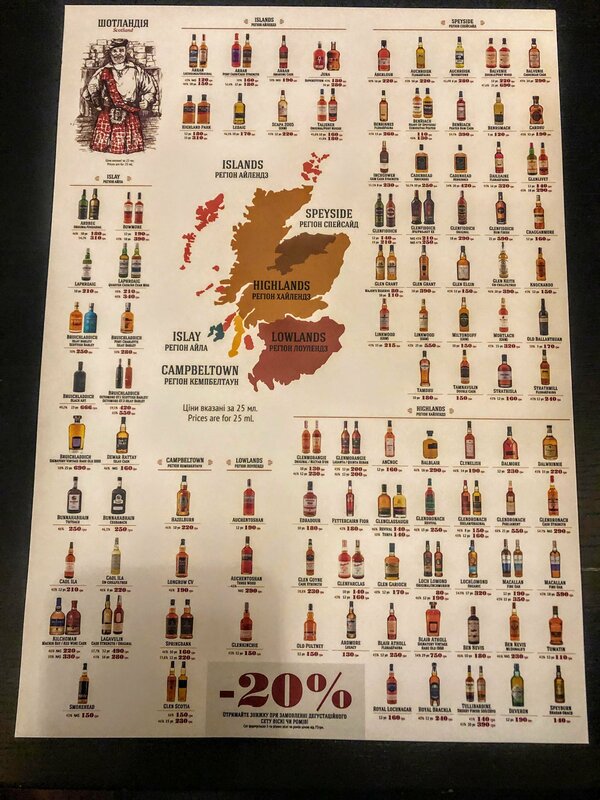 Glasses of Ukrainian wine are 24 uah / 1 usd for 100 ml but they have plenty of other options for true wine lovers as well. I’m going to admit it: I still don’t really know what tinctures are. 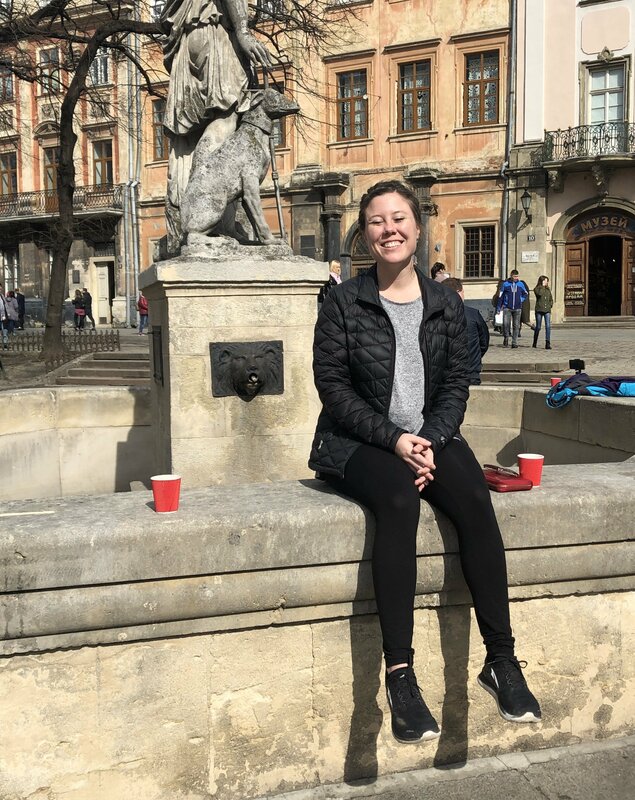 But I do know that everyone in Lviv drinks them and I want in on the action. (Ok, I Googled it.) 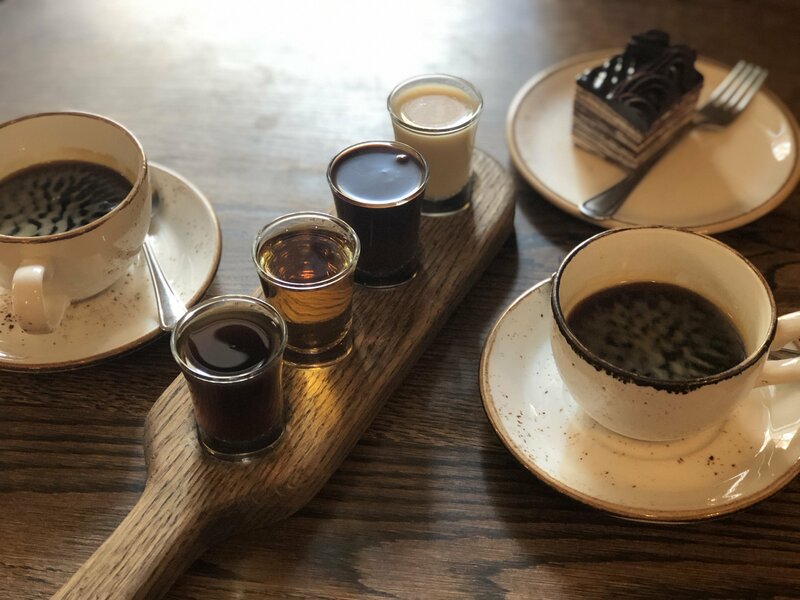 Basically, they’re shots made with different flavors and best drank alongside a coffee. Virmenka is the perfect cafe for your first tincture experience because they have tons of different flavors to choose from – Dan and I got a sampler with four tinctures for 76 uah / 2.85 usd. We chose the tiramisu, coffee, chocolate, and Old Lviv flavors (the last of which was on nearly every table and seems to be the most popular) and paired them with two Americanos and a piece of super moist Spartak (layered chocolate cake) for the most enjoyable Sunday morning I’ve had in a long time. Expect to pay: between 50 to 100 uah / 2 to 4 usd for shots, wine, or a pint of beer. 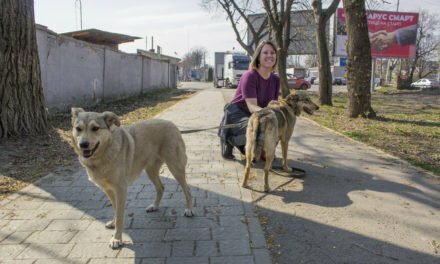 Kryivka may be the most popular and most written about bar in Lviv, and for good reason. 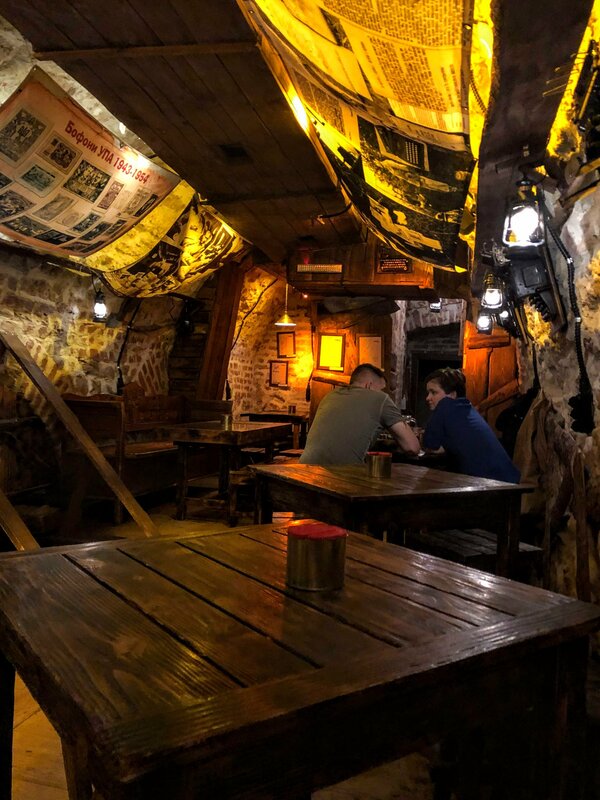 The hidden bar is located “somewhere in Rynok Square,” built into the last hiding place of the Ukrainian Insurgent Army during World War II. It serves traditional Ukrainian food (their fried pork ears are the best drunk food, hands down) and is themed with costumes, fake guns, and military memorabilia. Just make sure you know the password when you get to the door and are ready to take a shot of vodka from the guard, or he may just shoot ya dead. 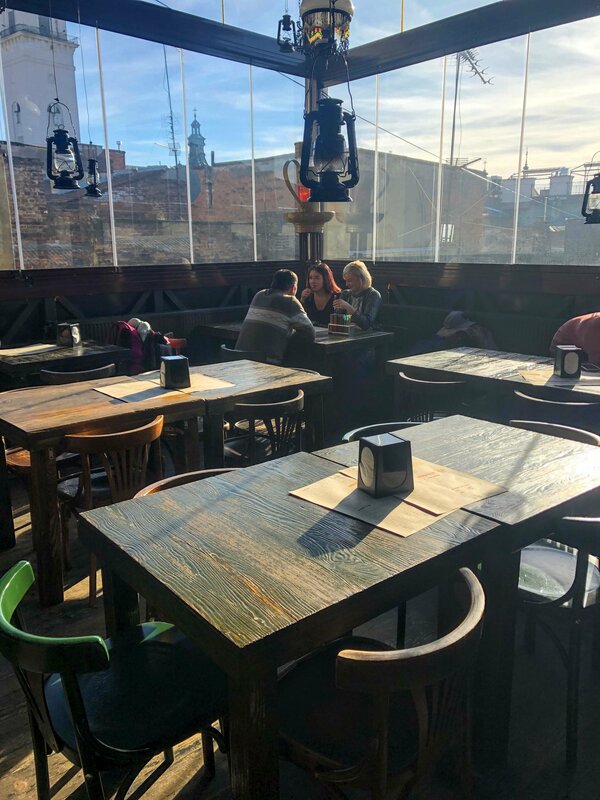 The gas lamp was invented by Jan Zech and Ignacy Lukasiewicz, two pharmacists from Lviv, so this bar has the second largest collection of gas lamps in the world to celebrate them. 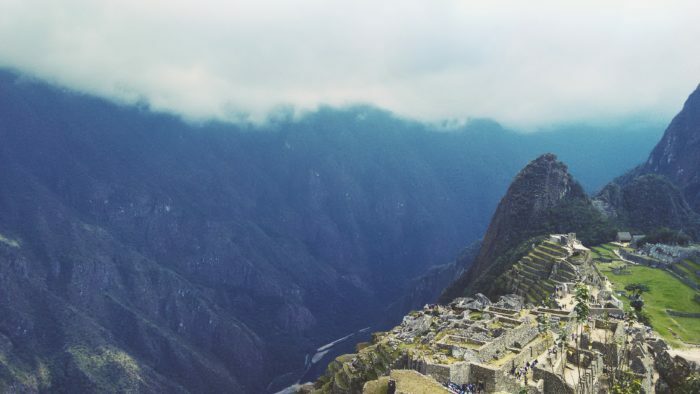 Climb up a rickety four-story spiral staircase for a seat with a view over the city’s rooftops and make sure to order a selection of colorful flavor-infused vodka shots served in test tubes to get the full experience. Silpo is located a bit outside of central Lviv but it definitely worth the walk if you’re planning a drunken night in. 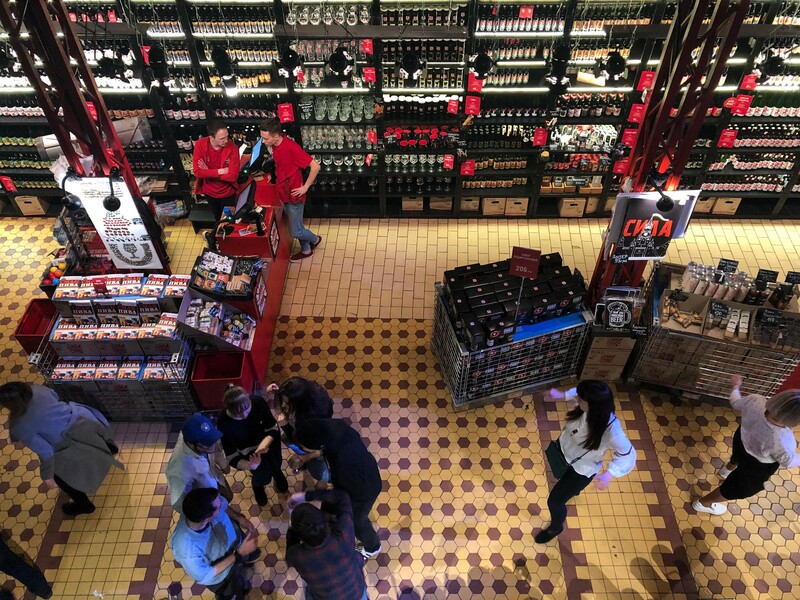 It has a surprisingly spectacular selection of craft beer and of course lots of wine and liquor as well. Silpo actually puts on their own craft beer festival in Lviv every year because one of the top guys at the company is really into it, so you know it also has one of the best craft beer collections in the city. 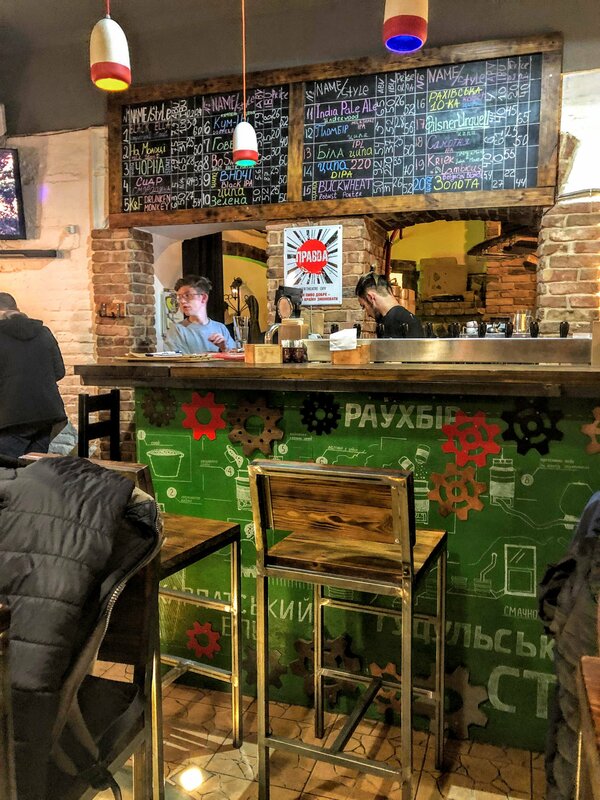 You can even find Pravda beers that they’re not currently carrying in their brewery (like the pumpkin ale) and beer from Varvar, another huge craft brewery from Ukraine (based in Kiev) that’s really good as well. They also have amazing, like I-can’t-stress-it-enough-amazing, baguettes so definitely hit up the bakery before you leave as well. 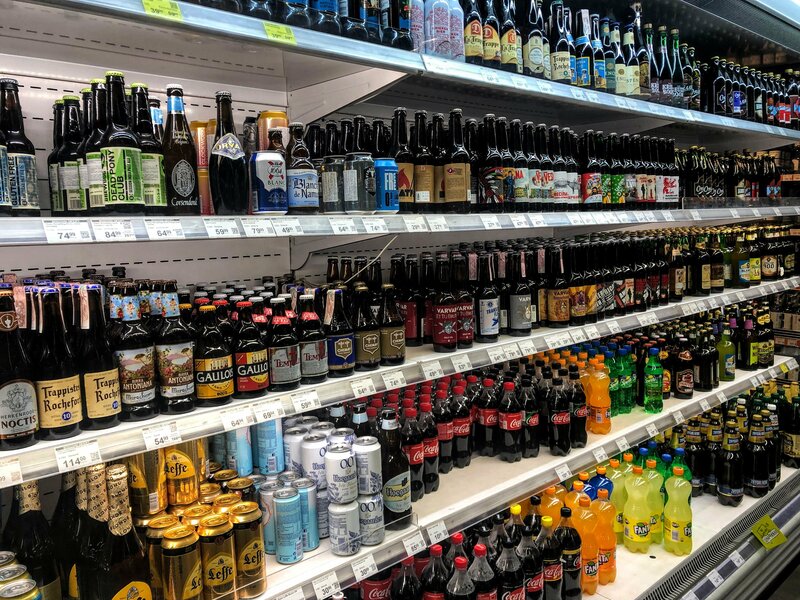 Simply put, if you’re looking for beer and wine for a night in your hostel, hotel, or Airbnb in Lviv, Silpo is definitely the best place to get it. 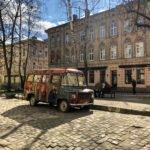 All 10 of the best bars in Lviv are in walking distance from Rynok Square so it’s super easy to visit them without an Uber, taxi, or tram. If you want to stay in Rynok Square itself, you can visit Pravda Beer Theather, Drunk Cherry, and Kryivka there all without leaving its confines. Tsypa is also just around the corner from Pravda Beer Theater so you can easily visit two breweries on the same block. Additionally, Bread and Wine, the Gas Lamp Pub, and Virmenka are all within a one minute walk of each other on Virmens’ka Street. 4Friends and Opera Underground are outliers, but still only a short walk from the city center. 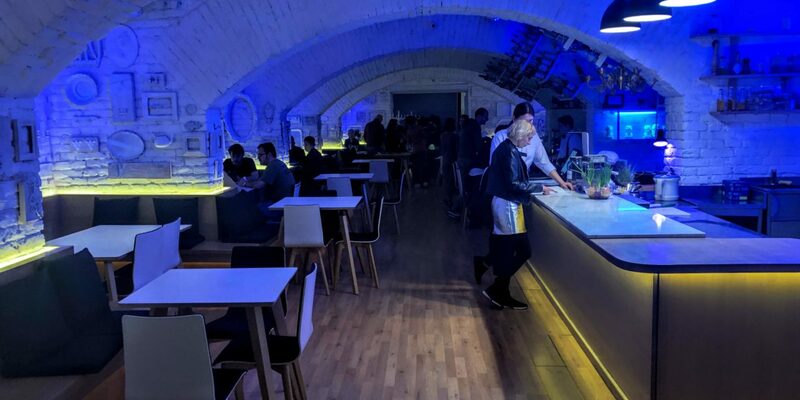 I recommend visiting Opera Underground after a show at the Lviv Opera Theater to get the full experience (plus, your ticket will get you a 15% discount on food orders). Whichever you decide to visit, you’re sure to discover that these 10 bars in Lviv do not mess around – get ready for good drinks at good prices and a really good time! 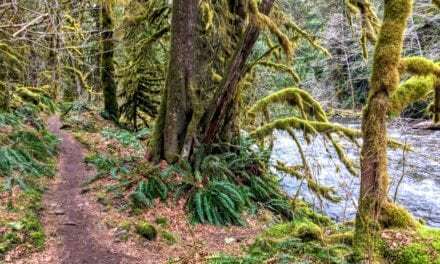 Ready to work off that hangover? Learn how to go hiking on the nearby Mount Parashka and how to take a castle tour through the famous Golden Horseshoe region of Lviv!